Want to record a play-by-play experience of a dreadful date and share it with other people live on the internet? There’s an app for that. Well of course you could do it on Facebook or Twitter, but if you want to keep your bitching anonymous – then you should consider BadOnlineDates, the iPhone app. You’ll also have the quiet pleasure of knowing that your experiences are being shared with people who need them. People also going through the trauma of bad dates who have gone on the Bad Dates app to know that they are not alone in suffering from the embarrassment and weirdness of DATES GONE WRONG. On the other hand – if you find your date staring fixedly at their phone, tapping furiously into, grab it out of their hands and check they’re not updating the BadOnlineDates app. If they’re texting their mum then apologise and return it. 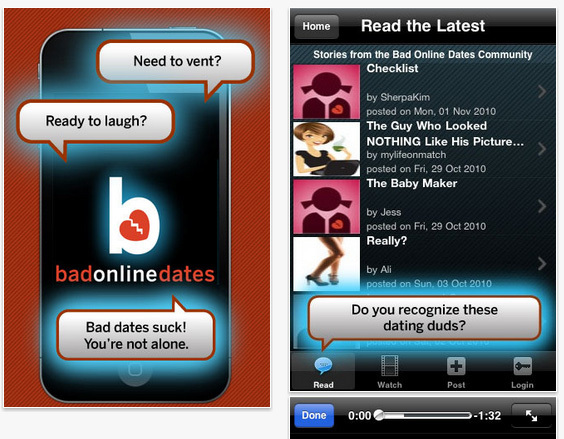 The BadOnlineDates app is tied to website and both the site and their app feature TV content they’ve produced themselves on the topic of truly dreadful dates and daters. Related: Email etiquette – who really cares if you put ‘dear’ or ‘hi’?